We offer Glittering Silk Holi Colors for our esteemed customers, who wants something new for their celebrations. These colors are manufactured using high quality raw material that helps in attaining a flawless range of Glitter Powder as per the exact specification of our esteemed clients. Color Red, Orange, Green, Blue etc. We offer Glittering Silk Holi Colors for our esteemed customers who wants something new for their celebrations. 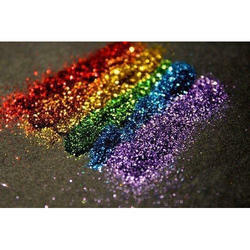 These colors are manufactured using high quality raw material that helps in attaining a flawless range of Glitter Powder as per the exact specification of our esteemed clients.